Happy Tuesday again! It is amazing how quickly a week can get away from us. Have you taken the time to step back and “smell the roses” this week?? If you haven’t… make a point to do so while reading this. Things are busy… yes. But you don’t want to miss out on the beauty of summer! Today we are going to discuss the 2nd (1st on the list) topic in examining the approach being used on our fields to survive heavy use- in particular the lacrosse events of the last 5 weeks. So how do we develop a stand of turfgrass to be so strong and resilient? If only it was simple right?!? It is every turfgrass manager’s driving goal. 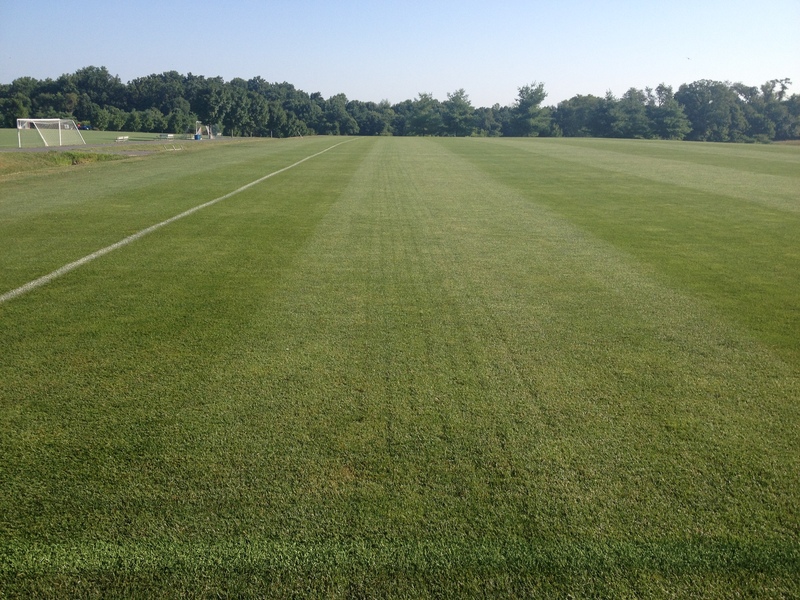 For our fields, strong, healthy turfgrass is a bi-product of focusing on 3 core maintenance practices- aggressive aeration, nutrient management, and bio-stimulant use in conjunction w/ growth regulator. To start, let’s examine core practice #1 today. Aggressive Aeration. 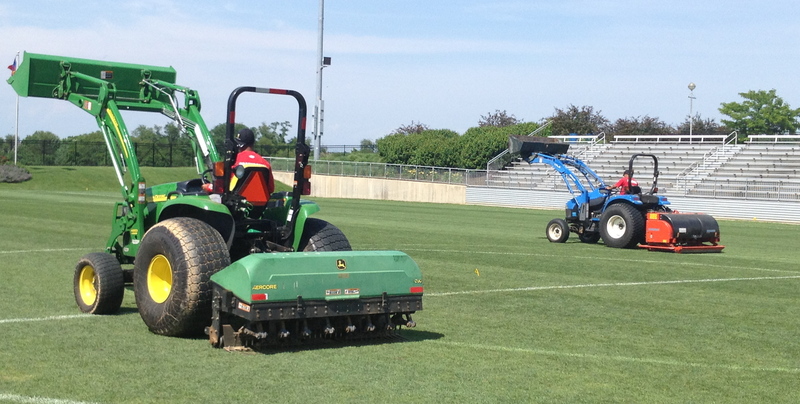 Aeration, in any form, is the most important part of maintaining grass on an athletic field. Period. It is the most under utilized part maintenance practice. Through observations of fields around the world, aggressive aeration is the single, most important maintenance practice on high traffic athletic fields. Just think about it this way: Is there a thin spot on your field? If so, is it a spot that is likely compacted= all the soil air forced out away from the roots? With 18 tournament fields on a native, silty clay loam soil; we have 40 acres of turfgrass that is constantly suffocating. The small particles that make up the silt and the clay allow very little air into the profile. Those particles also easily and quickly compact together to eliminate the air completely. There is positive in the situation- mechanical aeration is very effective in opening up the profile and allowing air in. The positive leaves quickly though, as the aeration results disappear quickly after only 1 weekend of play. 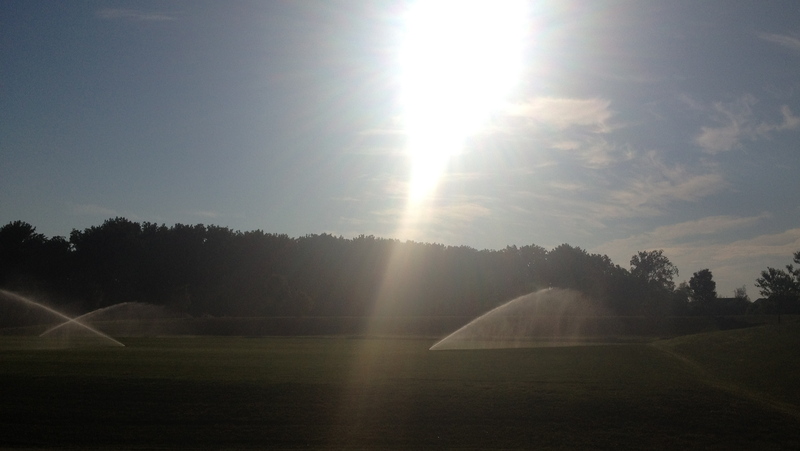 In order to achieve maximum turfgrass health, each field ideally would be aerated 1 time a week. 40 acres- 1 time s a week- 40 weeks per year (weeks the ground isn’t frozen). WOW. That would be alot! Instead the goal is 25 aerations for the year (close to 1 time every 10 days) through a combination of 7 types of aeration. 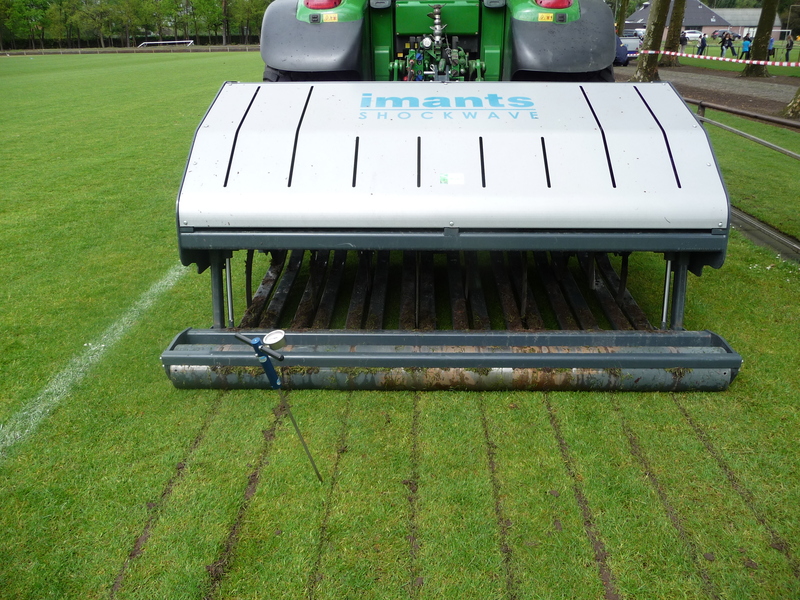 Core aeration always seems to have the most long-lasting positive results of the rapid tine aeration. And for good reason= from the removal of material. Deep tine aeration has always left positive results as well. BUT- the addition of a new linear soil wave aerator has made the largest impact on moving water vertically though the profile and decreasing maximum compaction. Lastly, our next addition to aeration is a combination of the 2 successes from rapid tine aeration and deep tine aeration. The Koro by Imants Recycling Dresser. 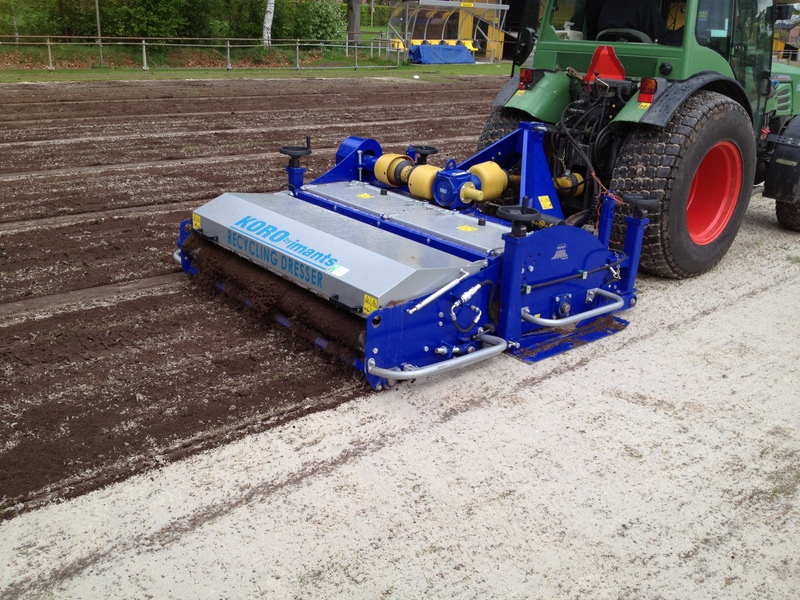 The Recycling Dresser uses linear aeration for de-compaction. But instead of using soil-wave.. it actually removes the material from the profile to flush air into the root zone as well. The removed material is dropped onto a conveyor belt and actually “recycled” as topdressing instead of in the form of cores that need cleaned up. Because the machine has the benefits de-compaction and for air introduction, this machines will compliment the other forms of aeration very nicely and lead to stronger turf. The Recycling Dress ultimately provides a tool that can make a significant difference for high traffic fields everywhere, especially for Parks Departments and High Schools that do not have the ability to close fields or spend lots of time aerating. Prepare to hear much more about the Recycling Dresser… it is a piece of machinery that will become common place in the next few years. This entry was posted in Maintaining a Strong, Healthy, and Durable Plant Under High Traffic, Sports Fields, Turfgrass Growth by GrowingGreenGrass. Bookmark the permalink.